I received a plastic toy trumpet for Christmas when I was six. Little did I know how much this would shape my future. One day a traveling salesman paid us a visit selling accordion lessons. My interest in the piano (I would play melodies by ear on our old upright at every opportunity) helped my parents decide to enroll my older brother and me in this ten-week course. I was no Lawrence Welk, but this was my first real experience reading music and those early seeds planted years ago were starting to take root. The summer before entering the 8th grade, my older brother Dan joined the Moeller band and so did I. Dan chose sax and I decided to play trumpet, – these were the same instruments we received that Christmas years before. Our grade school, like so many other parochial schools, didn’t have a music program to speak of. Enabling younger brothers to enlist early better prepared those individuals for the high school band. I was excused 15 minutes early from grade school so I could attend band practice. 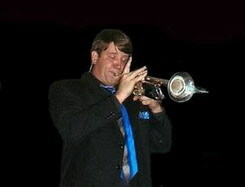 Being the competitive sort, I practiced and progressed quickly and by my freshman year, I was playing first trumpet and was invited to play in the Moeller stage band. The stage band opened my eyes and ears and I was immediately infected with the performance “bug”. My first professional opportunity came during my junior year at Moeller when an acquaintance of mine “had to get married” and I was asked to put a band together to play for his reception. I got my brother and several buddies from band together and played mostly familiar jazz band arrangements. The reception was at a VFW hall in Reading, Ohio where our sextet, without a name, played to rave reviews by the drunken crowd (all for a modest sum of money which didn’t bother us – even after almost 30 years, some things don’t change!) At the end of my senior year, I purchased my first and only trumpet on my way to college band. During this time I also developed an intense interest in vocal harmonies. I became a Beach Boy aficionado after hearing one of the local bar bands perform “Good Vibrations”. I collected and played their albums in an attempt to analyze and reproduce the vocal arrangements even going so far as to join a barbershop quartet so I could have a group sing my vocal arrangements. In addition, I was able to further my own music education by helping friends with their music theory homework and arranging music for stage and marching bands. In my spare time, mainly on weekends, my friends and I would frequent the Clifton bars to hear the local bands. I remember going to “Alexander’s” many times to dance and listen to a group, which played at many of our high school dances and had a killer horn section, called BlueStone Ivory (BSI). As I got closer to graduating in the late 70’s, I lost track of BSI and spent more time sitting in with a couple of wedding reception bands. Another goal of mine was to start a band of my own that would play songs by Chicago, BS&T, Tower of Power, etc. as well as the Beach Boys and Manhattan Transfer. Great vocal harmonies plus a horn section would make this group extremely marketable. I was going to have to wait until the end of my first year in law school to realize this dream. Having started Law School at UC in the fall of ’79, academics occupied my every waking hour. I was spending about 18 hours in class and studying a day and therefore didn’t have any time for music (assuming I wanted to get some sleep). My musical hiatus lasted only a semester and a half. As was the UC College of Law tradition before final exams, the students organized, wrote and performed in a variety show which in essence poked fun at the law professors – all while consuming large quantities of beer. It was the last big blast before exams. I decided to put together a small band to accompany some of the musical skits and to perform a few numbers on our own, just as I had done as an undergrad. To my surprise, there were some very talented musicians in the student body. The group consisted of a 4-piece rhythm section, 5 horns and 3 vocalists and was called the Negotiable Instruments. After our successful performance, a friend of mine, and I recruited some members of the Negotiable Instruments and started a band called Time Span. It consisted of bass, drums, guitar, two keyboards and myself on trumpet, trombone and sax. Time Span went through a bunch of early personnel changes including a new guitarist, bassist, drummer and pianist. The new pianist was Amy, one of the female vocalists from the Negotiable Instruments. She became my best friend in Law School and in 1985 would become my wife. Over the next 15 years Time Span would play a lot of wedding receptions and private parties. Amy and I had two children, both boys, who appear to have considerable musical talent and potential. Along the way, I became interested in audio engineering and recording. After additional study and training, I started Time Span Entertainment and TSE Records to do sound reinforcement and digital recordings in the tri-state area. To date, I have produced some Classical CD’s for members of the Cincinnati Symphony, demo’s for local bands as well as live concert recordings for area orchestras and churches. In the mid 90’s I met Tom Cecil whose was working for one of the local pro-audio stores. Having so many interests in common, we became good friends and eventually played in a couple of bands together. 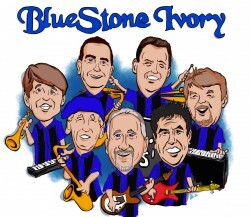 In 1999, while playing in one of those local bar bands, we were contacted and asked to join BlueStone Ivory. This brought my musical career full circle, giving me the opportunity to play with some extremely talented musicians from my high school alma mater in a group that I greatly respected for years. After a year with BSI, I am having the time of my life. I have been doing the horn charts for the group and am excited at some of the new material we will be doing in the coming months. The unrealized potential in the group is staggering and I look forward to developing that potential over the next several years.